"He will feed his flock like a shepherd. He will gently lead the mother sheep with their young" (New Living Translation - Isaiah 40:11). for doing his will" (New Living Translation - Hebrews 13:20-21). "God, the Master, says: 'From now on, I myself am the shepherd. I'm going looking for them. As shepherds go after their flocks when they get scattered, I'm going after my sheep. I'll rescue them from all the places they've been scattered to in the storms'" (Message - Ezekiel 34:11). "You were lost sheep with no idea who you were or where you were going. Now you're named and kept for good by the Shepherd of your souls" (Message - 1 Peter 2:25). "And [then] when the Chief Shepherd is revealed, you will win the conqueror's crown of glory" (Amplified - 1 Peter 5:4). ‘And God will wipe away every tear from their eyes’” (NIV - Revelation 7:17). So, if you are in need, He promises to provide. If you are hurting, He will be tender with you. If you have loved ones who have never found Him, or have wandered away, He is seeking them and will welcome them back. If you are weary, He awaits in eternity with your crown, a hug and a Kleenex for your tears. How do you need Him to be your shepherd today? 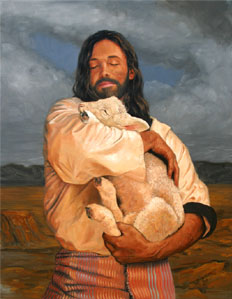 PRAYER: Thank You for this wonderful picture of Your care for me as my Shepherd. Help me to be a responsive, obedient sheep today. Amen. I only wish I have a list you can put your blog, thanks!! Of course I'll be your friend, Bogdan. I've looked at your blog. You've posted some beautiful photos. Unfortunately, since it's all in Romanian, I can't understand what it says. As a result, I don't feel comfortable linking to it in my sidebar.